Starting and sticking to a healthy eating routine is a task that takes planning, hard work, and dedication. Get your partner on board with these simple ways to mix in more produce! Wherever you are on your journey, we know you can do it! We also know that if you have a partner, adding in the dynamics that come along with sharing the process may present some challenges. Every individual has their own eating preferences, feelings, and opinions around food. 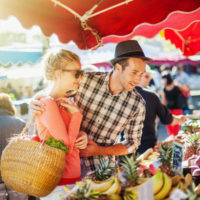 If you and your partner are on different pages when it comes to healthy eating, here are five ways that you can help your partner get on board with those healthy eating habits, and they might even start to feel excited about it! 1. Keep the healthy snacks in sight. This method can be as simple as setting a fruit bowl out on the countertop while stashing those more processed, less healthy snacks in the cupboard. Seeing fresh produce will help make your partner more inclined to grab that fresh clementine when they’re hungry instead of the bag of potato chips. As they say, out of sight, out of mind! Wash and cut up fresh fruit and veggies to share with your partner. When healthy snacks are easy to eat, your partner will be more likely to eat them. Try packing sliced apples or pears for you both to take to work- many people are more likely to eat fruit if it’s sliced up. Keep a container of chopped veggies, such as carrots, jicama, and cucumbers, ready in the fridge for handy snacking. Yes, even for adults, eating should be entertaining and enjoyable- fruits and vegetables included. Offer your partner corn on the cob or fruit or veggie kabobs, and pair your fresh veggies with tasty dips. Let’s face it – hands-on food is way more interesting and fun to eat! Make a savory herbed Greek yogurt dip for your veggies. Don’t be surprised if your partner ends up likes this just as much as onion dip! Make this delicious hummus or guacamole to add flavor, protein, and healthy fats to your veggie snacks. There are TONS of ways to boost fruits and veggies. Keep in mind that many people’s aversion to certain foods goes beyond taste- texture, color, and cooking method are important factors, too! Make a smoothie together and add in veggies such spinach, kale, carrots, or broccoli. Or, you can make fresh juice with fruits and veggies- experiment with different ingredients and proportions until you find that perfect balance of sweet and savory! Find ways to add extra vegetables to your classic dishes. For starters, add shredded zucchini and sliced mushrooms to your favorite tomato sauce, or mix in some spinach to homemade lasagna. Experiment with different ways of preparing vegetables. For some, the crisper texture of stir-fried or baked veggies is more appetizing than steamed. 5. Be open-minded and understanding, and keep the conversation going. Just as discussions and conversations about other areas of your relationship are important, talking about food is also crucial and can be motivational! In addition to making healthy food readily available, it’s important to listen to your partner and to be considerate of how they feel. Have a discussion about what they are open and willing to try, and see if they have any ideas about tasty ways to add in fruits and veggies.